Register now and we will email you the FREE download! Why backup Office 365 to Azure? Microsoft provides a wide array of powerful services within Office 365 – but a comprehensive backup of your Office 365 data is not one of them. 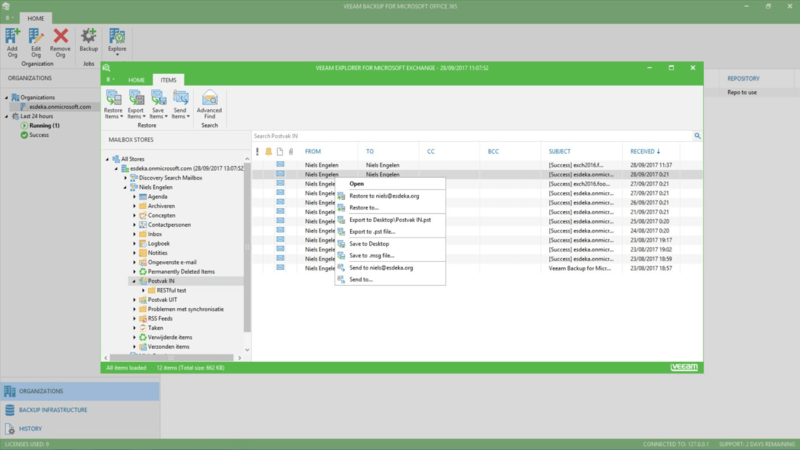 Veeam Backup for Microsoft Office 365 eliminates the risk of losing access and control over your Office 365 data including Exchange Online, SharePoint Online and OneDrive for Business – so that your data is always Hyper-Available and protected. 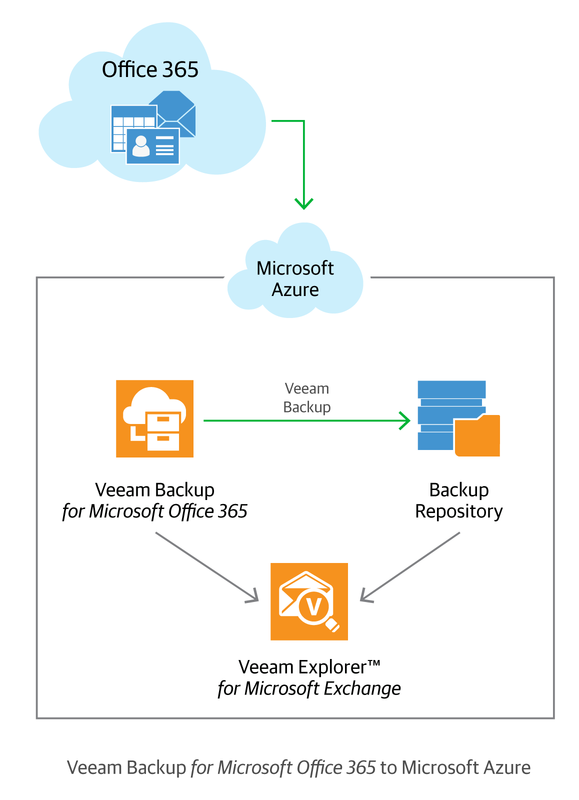 Veeam® Backup for Microsoft Office 365 eliminates the risk of losing access to your Exchange Online email data and ensures Availability to your users. Through joint solutions with Veeam and Microsoft, you can protect your Office 365 data and store your backup in an Azure Virtual Machine. Many assume that since Office 365 already resides in the cloud, there is no need to have another copy of the data. Although Microsoft provides SLAs to keep Office 365 mailboxes up and running, you still need to have another copy to ensure business continuity, and Azure is the perfect destination. At any time, organizations may be required to provide dated emails, or may have specific compliance requirements for retention. Microsoft Azure provides a reliable way to maintain long term storage, to ensure access of emails regardless of when they were sent or received. Backing up Office 365 is necessary for true protection of email data, but organizations should also be leveraging a cloud-first strategy to get the most benefit. Eliminate costs, and remove the need for an Exchange server on site by sending Microsoft Office 365 backups to Azure. Over 55,000 organizations have used Veeam Backup for Microsoft Office 365 with over 7 million protected Office 365 mailboxes. 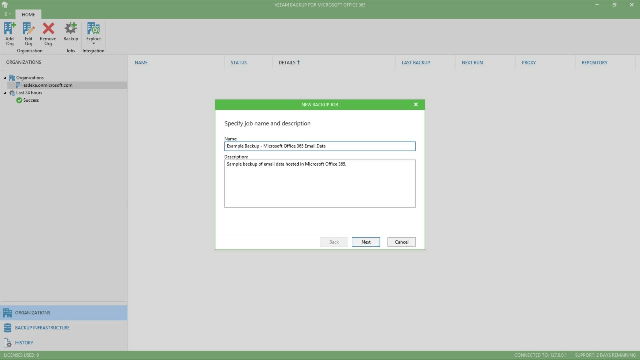 When you use Veeam, it’s less about where data sits and more about visibility, access and control. That’s why we love Veeam — we can ensure availability of data on-premises and in Microsoft’s cloud. Combining Microsoft and Veeam is a win-win all around. Backup Exchange Online, SharePoint Online and OneDrive for Business data from Office 365 weekly, daily, or even as often as every five minutes. Store backups in the location of your choice — including on-premises, in a hyperscale public cloud (i.e. Microsoft Azure or AWS) or with a local service provider. Never settle for less than reliable, granular restore of Office 365 email items, SharePoint sites, documents, libraries and lists as well as OneDrive for Business accounts, files and folders in a few simple clicks. 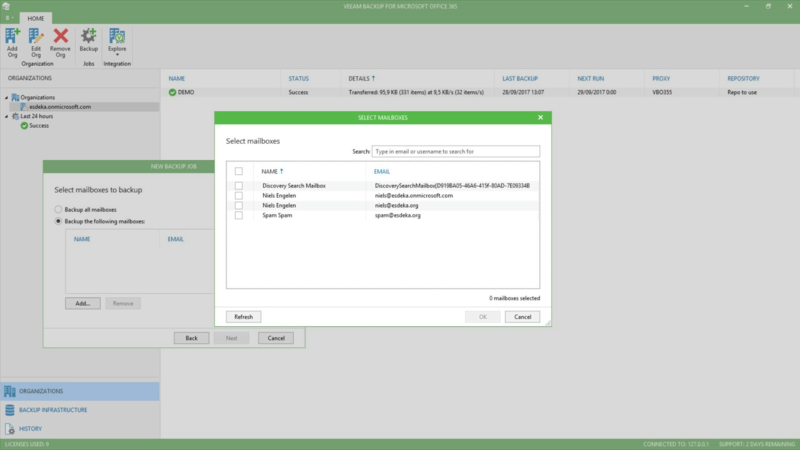 Veeam’s industry-leading number of ways to restore gives you ultimate flexibility and control of your data. Without an easily accessible copy of your data, retrieving emails for regulatory or compliance needs can be a costly, time consuming, and a major disruption to your business. With Veeam, you can leverage advanced search capabilities and flexible recovery options to perform eDiscovery of Office 365 archives. Try it today free for 30 days (for unlimited users) or free forever up to a maximum of 10 users and 1 TB of SharePoint data.